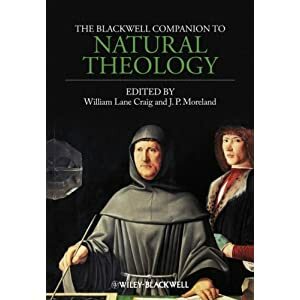 The Blackwell Companion to Natural Theology is now the third book that I have partnered with Bill Craig to either co-author (e.g., Philosophical Foundations for a Christian Worldview) or co-edit (e.g., Naturalism). In this volume, we sought to rally and mobilize some of the foremost influencers in contemporary analytic natural theology in order to give them the opportunity to develop their arguments at length and to interact with the arguments’ critics. The resulting volume of eleven chapters is a sophisticated compendium of theistic arguments. When you write, edit or contribute to such a volume as this, sure it’s impressive and it certainly bodes well for the CV, but you also often feel like this is serving more than just the good of contributing to a high-level of scholarly discussion. If Christian intellectuals are like political representatives – when they are not scandalized or besmirched by loony thinking! – participating in a compendium like this is a lot like representing the people “back home.” You feel a little like “Mr. Smith Goes to Washington.” You are not merely representing an argument, but you are representing the believers and the stake-holders concerning the plausibility of knowledge of God. At the very least, Christian intellectuals are public spokespersons. The volume opens with an essay on the project of natural theology by Charles Taliaferro. He not only provides a historical perspective on contemporary debates over theistic arguments but, even more, also emphasizes the importance of issues in the philosophy of mind for the viability of natural theology. To anyone who is not open to the notion of an immaterial mental substance distinct from a material substratum, the whole project of natural theology is abortive. Taliaferro, therefore, seeks to show that we are far from warranted in being confident that substantial minds are impossible, so that we must be open to the project of natural theology. In chapter 2, Alexander Pruss explores the first theistic argument under discussion in this volume, the argument from contingency or the version of the cosmological argument classically associated with G. W. Leibniz. The argument attempts to ground the existence of the contingent realm of things in a necessarily existent being. Prominent contemporary proponents of theistic arguments of this sort include Richard Taylor, Timothy O’Connor, Robert Koons, Richard Swinburne, Stephen Davis, and Bruce Reichenbach, among others. A cosmological argument of a different sort, one largely neglected until recent decades, is the so-called kalam cosmological argument. Based upon the finitude of the temporal series of past events, the argument aspires to show the existence of a personal Creator of the universe, who brought the universe into being and is therefore responsible for the universe’s beginning to exist. Philosophers such as G. J. Whitrow, Stuart Hackett, David Oderberg, and Mark Nowacki have made significant contributions to this argument. In their treatment in chapter 3, Bill Craig and James Sinclair examine afresh two classical philosophical arguments for the finitude of the past in light of modern mathematics and metaphysics and review remarkable scientific evidence drawn from the from the field of astrophysical cosmology that points to an absolute temporal origin of the cosmos. With this argument, we begin to see the intimate and fascinating links between natural theology and developments in contemporary science that philosophers cannot afford to ignore. Those links are in full view in Robin Collins’s treatment of the teleological argument in chapter 4. John Leslie, Paul Davies, Richard Swinburne, William Dembski, Michael Denton, and Del Ratzsch are among the many defenders of this argument today. Focusing on the fine-tuning of nature’s laws, constants, and initial conditions, Collins asks how this amazing fine-tuning is best explained. He argues that the evidence strongly confirms the hypothesis of theism over an atheistic single universe hypothesis and, moreover, that appeals to a multiverse or a many-worlds hypothesis in order to rescue the atheistic position are ultimately unavailing. The argument from fine-tuning concerns the design of the universe with embodied moral agents in view. Our volume focuses on such agents in moving from the external world to the internal world of human persons in my essay on the argument from consciousness in chapter 5. Setting aside panpsychism on the grounds that, first, it is a label for the problem of consciousness’ origin and not a solution and, second, theism and naturalism are the only live options for most Western thinkers, I lay out the ontological constraints for a naturalist worldview that follow most plausibly from a naturalist epistemology, etiology, and core ontology, to wit, there is a burden of proof for any naturalist ontology that ventures beyond strict physicalism. I then present and defend the central premises in an argument for God from the existence of consciousness or its lawlike correlation with physical states (the argument for God from consciousness, here after abbreviated as AC). Given AC as a rival to naturalism, there is an additional burden of proof for a naturalist ontology that quantifies over sui generis emergent properties such as those constitutive of consciousness. After characterizing epistemically the dialectical severity of this burden, in the final section, I rebut the three most prominent naturalist theories of the existence of consciousness, namely, the views of John Searle, Collin McGinn, and Timothy O’Connor. Contemporary advocates of this argument include Charles Taliaferro, Richard Swinburne, and Robert Adams. Partially due to the theistic connection between finite consciousness and God, a cottage industry of versions of physicalism has sprung up to eliminate consciousness in favor of or to reduce consciousness in one way or another to something physical. While this will be a hard sell to many, the existence and nature of reason cannot easily be treated along these lines on pain of self-referential inconsistence. Thus, in chapter 6 Victor Reppert develops an argument from reason for God’s existence based on the reality of reason in human persons. Similar arguments have been developed by C. S. Lewis and Alvin Plantinga. Although the argument takes a number of forms, in all instances, according to Reppert, it attempts to show that the necessary conditions of logical and mathematical reasoning, which undergird the natural sciences as a human activity, require the rejection of all broadly materialist worldviews. Reppert examines the argument’s history, including the famous Lewis–Anscombe controversy, and indicates how the argument from reason can surmount Anscombe’s objections. He then investigates three sub-arguments: the argument from intentionality, the argument from mental causation, and the argument from the psychological relevance of logical laws, showing how these demonstrate serious and unsolved difficulties for materialism. Having laid out two features of anthropology that are recalcitrant facts for naturalists but which provide evidence for theism – consciousness and reason – a third theistic friendly purported fact about human persons is that they are moral agents with intrinsic value. Thus, we next turn to metaethical issues, as Mark Linville presents a moral argument for God’s existence in chapter 7. Contemporary philosophers who have defended various versions of the moral argument for theism include Robert Adams, William Alston, Paul Copan, John Hare, and Stephen Evans. Linville argues that naturalists, committed as they are to the blind evolutionary development of our cognitive faculties in response to the pressures to survive, cannot be warranted in their moral convictions, in contrast to theists, who see our moral faculties as under the suzerainty of God. Linville also contends that atheistic views of normative ethics, in contrast to theistic views, cannot adequately ground belief in human dignity. If we trust our moral convictions or believe in personal dignity, we should, then, be theists. Moral considerations raise naturally the problem of evil in the world. In his chapter 8, Stewart Goetz distinguishes between the idea of a defense and that of a theodicy, and defends an instance of the latter. As a prolegomenon to his theodicy, Goetz examines the purpose or meaning of an individual’s life. Although the vast majority of philosophers, including those who write on the problem of evil, have shown little or no interest in this topic for far too long, Goetz believes that an understanding of the purpose for which a person exists provides the central insight for a viable theodicy. This insight is that a person exists for the purpose of experiencing the great good of perfect happiness. Given that perfect happiness is an individual’s greatest good, Goetz argues that it supplies the core idea for why God is justified in permitting evil. Main contemporary contributors to a theistic treatment of evil include Alvin Plantinga, William Alston, Richard Swinburne, Marilyn Adams, Peter van Inwagen and Stephen Wykstra, among many others. One aspect of the problem of evil is God’s apparent inactivity in the presence of evil and in the midst of ordinary, daily life. On the other hand, it has been the testimony of millions of people that God Himself has shown up in their lives and that they have both experienced His presence and seen effects in and around their lives that only He could do. (I discuss some of this in Kingdom Triangle and in my co-authored book with Klaus Issler, In Search of A Confident Faith). Human persons are not only moral agents, they are ineluctably religious. According to Kai-man Kwan in chapter 9, the argument from religious experience contends that given the appropriate premises, we can derive from the religious experiences of humankind a significant degree of epistemic justification for the existence of God. Kwan has no intention of arguing here that only one particular theistic tradition (such as Christianity) is correct. He focuses on a subclass of religious experiences, the experiences of God or theistic experience, and argues that theistic experiences provide significant justification for belief in God. Kwan does not claim that his argument is a conclusive argument on its own, but he does think that it is a reasonable argument that can contribute to the cumulative case for the existence of God. Contemporary defenders of arguments from theistic religious experience include William Alston, Jerome Gellman, William Wainwright, and Keith Yandell. The summit of natural theology is the famous ontological argument, which would infer God’s existence starting from the concept of God as the greatest conceivable being. This argument, if successful, will give us God with all His superlative, great-making attributes. Recent defenders of the argument in various forms include Charles Hartshorne, Kurt Gödel, Norman Malcolm, Alvin Plantinga, Clement Dore, Stephen Davis, and Brian Leftow. In his essay in chapter 10, Robert Maydole, one of the most recent philosophers to enter the lists on behalf of the ontological argument, examines classical statements of the argument along with contemporary reformulations. He argues that some versions of the ontological argument are not only sound but also non-question-begging and are not susceptible to the parodies that detractors of the argument frequently offer. Our final essay moves from generic theism to specifically Christian theism, as Timothy and Lydia McGrew develop in some detail an argument from miracles, the miracle in this case being the central Christian miracle of Jesus of Nazareth’s resurrection. Scholars who have made significant contributions to an argument of this sort include Wolfhart Pannenberg, N. T. Wright, Gerald O’Collins, William Lane Craig, Stephen Davis, Richard Swinburne, Dale Allison, Gary Habermas, and a host of New Testament historians. McGrew and McGrew’s contribution lies in their careful formulation of the argument in terms of Bayes’s Theorem, showing how, pace David Hume, miracles are positively identifiable as the most probable hypothesis despite the prior improbability of a miracle claim. They argue that in the case of Jesus’s putative resurrection, the ratio between the likelihoods of the resurrection hypothesis and its contradictory is such that one ought to conclude that the resurrection hypothesis is the most probable hypothesis on the total evidence. The foregoing arguments, while not exhausting the range of arguments of contemporary natural theology, do serve as representative of the best work being done in the field today. It is our hope that the present Companion will serve as a stimulus to the discussion and further development of these arguments. It offers a sophisticated treatment of contemporary analytic natural theology. It offers more than just arguments for generic theism but also arguments specifically for Christian theism. It is well-researched and offers interactions with high-level influencers in the relevant literature.